Simple Radiance products are perfect for women over the age of 25 who are noticing that the natural strains of everyday life are taking their toll on their complexion. They are packed with Mango goodness to hydrate and refine the skin, while light reflecting particles illuminate the skin and even out skin tone for a visibly brighter looking finish. The Simple Radiance Brightening Moisturiser (RRP £6.99) contains SPF10 to help avoid premature signs of ageing, whilst the light reflecting particles protect, condition and illuminate skin throughout the day. Enriched with mango extract skin will be left feeling hydrated and refined. The Simple Radiance Brightening Eye Cream (RRP £7.99) revitalises and hydrates tired eyes, improving the appearance of dark circles and illuminating the delicate eye area. What’s more, the mango extract and light reflecting particles help to give your eyes a well earned boost. The Simple Radiance Brightening Cleansing Wipes (RRP £4.99) contains the perfect blend of mango goodness and added moisturisers to cleanse, exfoliate and remove impurities. They also contain no alcohol or oil so are non drying or greasy. The Simple Radiance Brightening Eye Make-Up Remover Pads (RRP £3.99) effectively removes even waterproof mascara and hydrates the delicate eye area. 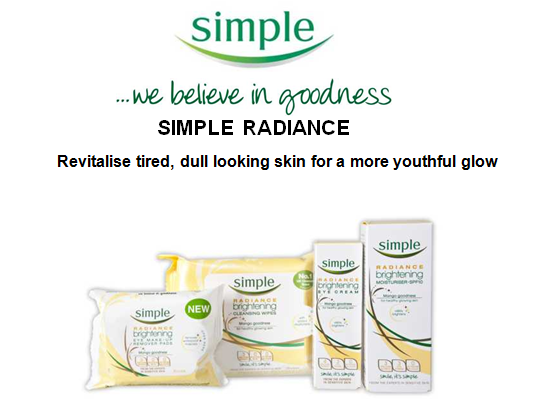 I was sent some samples of the Simple Radiance range and must say so far I am very pleased with each of them. I've been using the eye cream and moisturiser every day this week and must say my skin does feel a little smoother and firmer. I'm very pleased with the results. I love the wipes too, being a busy mummy most days these save so much time and hassle. I know I will definitely continue to use them and will be buying more once they run out. I've always liked Simple products as they're kind to your skin, these are no different. Great priced products that look after your skin and make a difference to your daily life. A well deserved 5/5 from me. I'm very happy with them.